The Santos #68 is the newest and possibly the finest centrifugal juicer on the market. 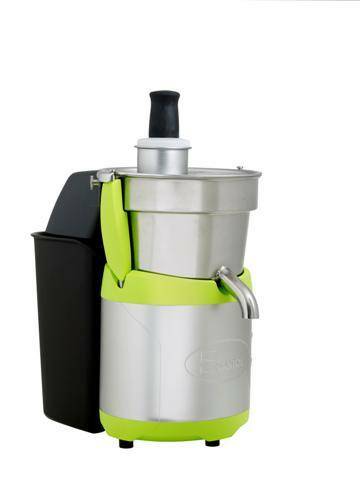 Made in France, This juicer incorporates over 60 years of manufacturing and juicing experience. Now with even higher output … up to 140 liters/hour (40 Gallons) of juice per hour. Apples, carrots, tomatoes, cucumbers, celery, cabbage, onions, beets, pears, spinach, etc. The clearance from the spout to bottom of the unit is 9" high. Standing Weight - 55 lbs. Manufacturer’s warranty - 2 years on the unit, 5 years on the motor. 5/5/2016 – I previously had a Santos 28. To clean the basket we had to use a wrench to remove the basket and blade to clean it. Is . . . Response From Healthnut Samson A&B Health Wholesale: There is no tool required for installation or removal of the basket. To assemble you simply put the basket in place and it will seat itself. It is held in place by centrifugal force when the machine is running. When the machine stops the basket is easily removed just by lifting. No tools required. 3/21/2016 – I successfully received my Santos #68 juicer. However, during the assembly of the juicer I found that part #20, figure 9 . . . Response From Healthnut Samson A&B Health Wholesale: FROM MANUFACTURER - This is no longer installed on production units. It was originally designed to keep pulp from reaching the juice when the strainer basket was dirty. It was determined to cause more problems than it solved so it was removed from production units.